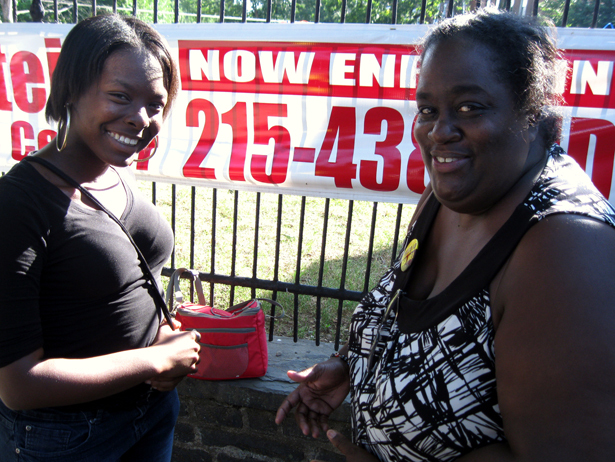 More than 1,000 people rallied against Pennsylvania's voter ID law this week. 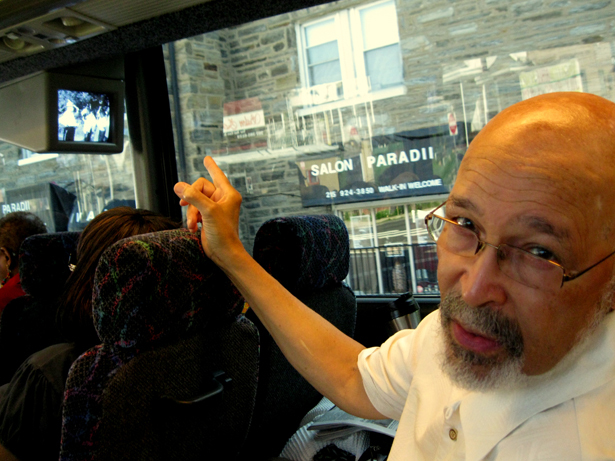 James Cersonsky shares his images from a "Freedom Ride" bus to the capital. As Election Day approaches, we’ve seen increased reporting on voter suppression schemes. Journalists, lawyers, and academics are all weighing in, and our own project, Voting Rights Watch 2012, continues to investigate beyond the headlines, from a battle over the Voting Rights Act in Texas to purge lists in Florida and beyond. But we’re also curious about what’s happening at the community level, and sparking a conversation about why communities that are often either ignored or bashed by elected officials of all stripes would care about voting rights in 2012. Last week, I introduced you to Miracle Randle, a rising college senior whose own family history inspired her get involved to defeat a ballot measure in Minnesota what would require ID to vote. Over the coming weeks, we’ll introduce you to more community activists and bloggers, who will explain what draws them to work against voter suppression. Several of them are also joining our Voting Rights Watch 2012 team as community journalists, offering additional eyes and ears in their districts and states. One of those team members is James Cersonsky in Pennsylvania. He works with Philly’s Teacher Action Group and Asian-Americans United around education reform and community-centered pedagogy. Aside from his activism, he’s also a writer who will be sending us missives about how everyday people in Philly are organizing around the state’s voter ID law. This week, as the state’s Supreme Court hears a case challenging that law, James joined a group of voters who evoked the civil rights era Freedom Rides to highlight the racially biased impact of the law. Here’s his report from the bus to Harrisburg. As Pennsylvania’s voter ID law was being fought inside the state’s Supreme Court this week, more than 1,000 people rallied outside the state’s capital in protest of the law, which may disenfranchise up to 43 percent of Philadelphia’s voters. Shortly after the law passed in March, leaders from the Northwest Philadelphia Coalition started a neighborhood-based campaign called “Keeping my Vote”. Since then, the group has recruited scores of volunteers to organize neighbors around voting rights and ensure people have the right documentation to vote in November. 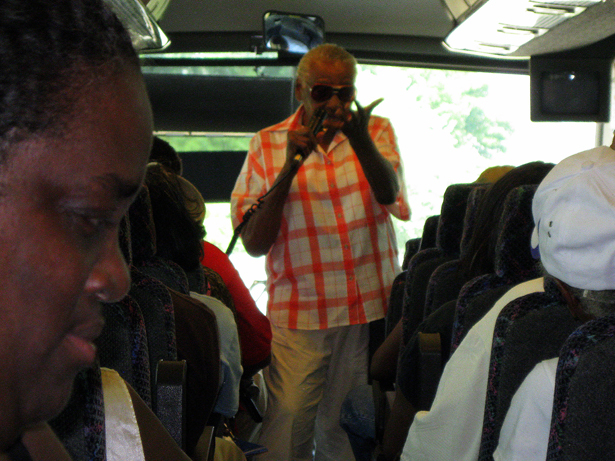 On Tuesday, group members joined with others from the statewide Voter ID Coalition to take buses to the capital. I met up with forty people at Germantown’s Johnson House—a stop on the Underground Railroad that now runs youth programming on histories of protest—for a “Freedom Ride” to Harrisburg. We shared stories, watched videos, belted out gospel songs and took a rest along our two-hour bus trip before spending the day at the capital, denouncing the voter ID law. Here are some photographs from our ride. On the ride to the capital, we watch clips from PBS’ Eyes on the Prize, which recounts the story of civil rights activist Medgar Evers. Mjenzi Traylor laments, “People don’t have the advantage of having this history in their communities and homes.” In 1967, Traylor was arrested at Philly’s school district headquarters for protesting the shortage of black teachers and lack of black history taught in city schools. Before that, he was president of the NAACP of Flint, Michigan, where he led a rally—attended by Governor George Romney—following Medgar Evers’ murder. Though Leandra Hunter (left) won’t be 18 by November, she’s enthusiastic about educating her peers on civil rights and civic engagement. Hunter, a high school senior who recently received certification as a nursing assistant, wasn’t always into politics herself. When she applied for a job with Philly’s WorkReady summer program, she described herself as a people person, which landed her at the office of State Representative John Myers. There, under the mentorship of youth organizer Annette Young-Gordy (right), she helps provide clothing, food, and ID support to district residents. 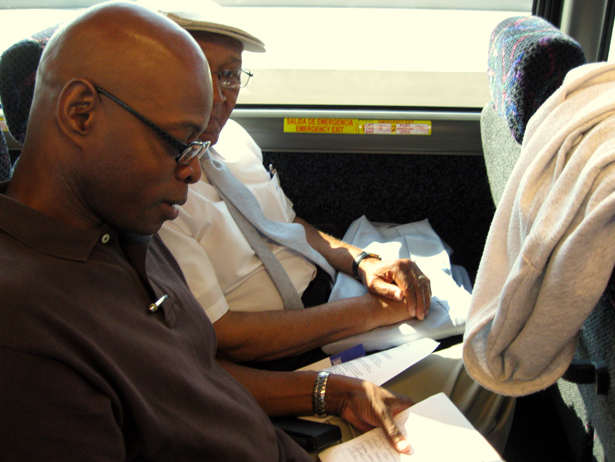 En route to Harrisburg, Stephen Kinsey (left) signs up for the Johnson House mailing list while his “body guard,” 85-year-old Nathan Thomas, watches. Kinsey will replace the soon-to-be retired Representative Myers after winning a three-way primary in April. Already, Kinsey has been inundated with calls from neighbors concerned about the state’s new voting requirements. Clarice McIntosh (second from right) maintains her support for Obama, but says that change begins with grassroots organizing. McIntosh grew up in Ohio as a “rebel child” and Vietnam dissident inspired by the likes of Angela Davis and Malcolm X. Along with her husband Lee (second from left), she volunteers with Concerned Citizens for Change, a former subsidiary of ACORN. Tara Smith (far right) sees a priority role for women as activists and leaders: “As soon as we organize, we can get the men to follow.” Marvetta Coleman, Smith’s red-and-white-clad sister from the Delta Sigma Theta sorority, was a co-host of the Harrisburg rally. Smith’s voter activism is also a natural outgrowth of her job. After the rally, she headed to West Philly to lead a neighborhood meeting for Town Watch, a city community policing initiative in which she serves as a Community Support Specialist.